Mid-week during my sister and aunt’s visit to Puerto Rico, we decided to do a walking tour of San Juan with Castillo Tours. Our driver and guide, Hector, picked us up at home and drove us on the scenic beach road and we arrived in Old San Juan half an hour later. First stop was the Capitol building. 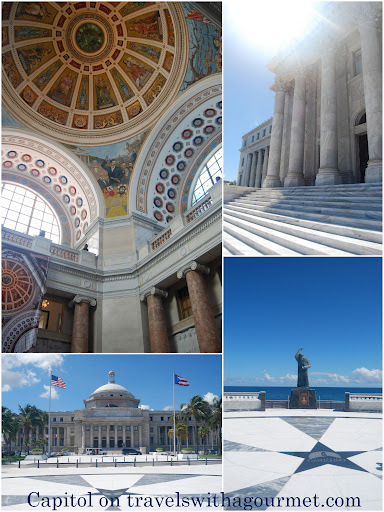 Constructed from 1925 to 1929, this all-white marble Neo-classical structure houses the Puerto Rican legislature and is the first historical building we see upon driving into old San Juan. The interior dome is decorated in fine mosaic of historical events in Puerto Rico. There is a also plaza across the street right by the water with all the escudos (shield/badges), also in mosaic, of all the towns of Puerto Rico. 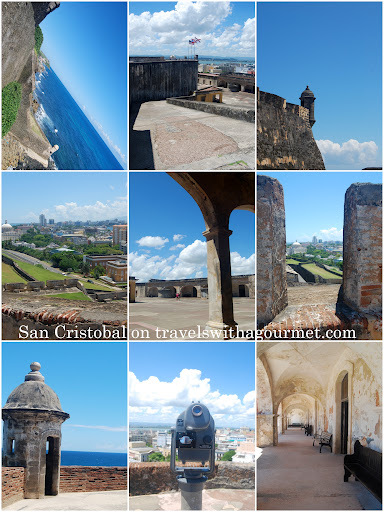 Next stop was the imposing Castillo San Cristobal where we climbed up then went down into the dark and claustrophobia-inducing dungeons then up again into the main interior square and then towards the view deck where we had a bird’s-eye view of old San Juan. From there, we walked some more and visited the other main fort Castillo San Felipe del Morro, otherwise known as El Morro where the beautifully-preserved grey lighthouse is and a large area which gave us a fantastic view of the sea. From there. we walked through the blue-cobble-stoned streets, pavers that were brought over by the Spanish and used to line the tiny streets of Old San Juan. 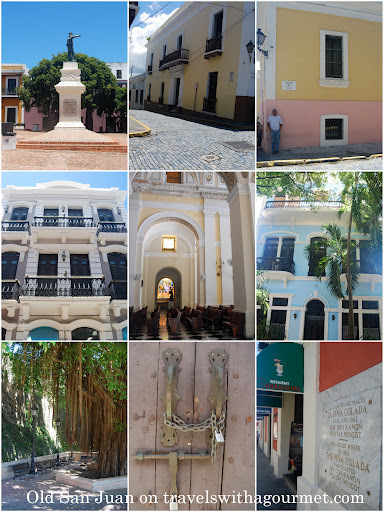 We stopped and sat under the shade of a plaza where the Museo Pablo Casals was located then continued our walk towards the water and outside the main gate into old San Juan where there is a tree-lined walkway adjacent to the sea. By then, the heat was unbearable and as we forgot to bring our straw hats (a must when exploring the Caribbean), we stopped one more time in the shade and had a limber, a local frozen treat similar to a Popsicle, usually flavored with coconut, pineapple or lemon and a refreshing treat on a sweltering Puerto Rican day. We then walked towards the cathedral and had a quick look at the historical Hotel El Convento then explored a bit of Calle Fortaleza, one of old San Juan’s main streets with lots of little restaurants and shops with Barrachina, a must-stop for it’s shady courtyard and especially to sample a complimentary glass of Piña Colada in the place where it was invented in 1963. It was almost 2:00 p.m. when we decided to head back home but before we did, we made one last stop for a takeaway lunch of a Puerto Rican treat, a mallorca con jamon y queso from the famous Cafeteria Mallorca. 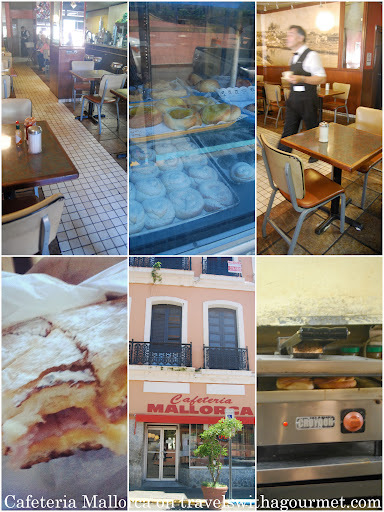 Now that both La Mallorquina and La Bombonera have closed down, Cafeteria Mallorca is the only place in old San Juan to have the classic mallorca, a sweet brioche type bread from Spain, plain with butter or toasted with ham and cheese along with a cup of milky coffee. If you have time, sit at the retro diner counter, be served by the bow-tied old-timers and watch the locals for a taste of old San Juan. *Open daily for lunch, dinner and drinks from 11:00 a.m. to 10:00 p.m. , On Wednesdays from 11:00 a.m. to 6:00 p.m.